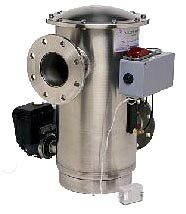 Cone Filters are used to catch and filter any type of debris from a waste stream. A variety of mesh screens are available to remove micron-sized particulates as well as larger, 1/4″ sized particles. The cone filter has been highly successful in many applications such as pumping from wells and sump pumps. All models of the Cone Filter series will operate with less than a 1-PSI pressure loss at maximum flow when clean. This efficiency provides real energy savings when compared to filter products that rely on energy consuming devices like spinners and torpedoes to give a comparable cleaning action. Choosing a filter with sufficient surface area is critical in any application. The Cone Filter series has significantly more surface area than most traditional basket and y-strainers. Ecologix has a filter that will fit your specific needs with units available from 2″ to 10″ and flow rates up to 2,000 GPM (higher flow rates are achieved by manifolding multiple filters). Our screen mesh options are available from 16 to 250 mesh. 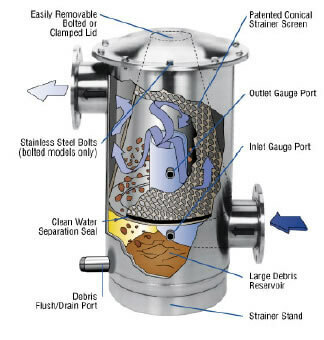 To enhance our Cone Filter line of unique strainers, Ecologix has an Instrumentation Package that will monitor your differential pressure and will automatically backflush your strainer over a period of time. The Pressure Differential Alarm Package (PDA) continously monitors the inlet and outlet system pressure. When the filter screen becomes dirty, a switch-gauge triggers an aubible siren and visual flashing alarm. These alarms are intended to alert maintenance personnel that the strainer screen needs to be removed from the strainer housing for manual cleaning.